I’ll say one thing for the high schoolers participating in the “March For Our Lives“ political front: they are no more ignorant about guns and the Constitution than their anti-gun, adult counterparts. These naive kids are learning the charms of virtue signaling, newly imbued with so much superstition, misconception, misplaced blame, and inflated self-regard that you’d be hard-pressed to engage most of them in reasoned discussion. But I reserve my highest disdain for adults who shake their fingers and say, “How dare you speak critically of these poor kids, who survived the tragedy that took place at their very own school.” Indeed, some of the Parkland students saw the mayhem with their own eyes. but that admonition is a sham show of indignance designed to squelch legitimate debate. The debate would be unnecessary if not for the anti-gun lobby’s opportunistic exploitation of children befallen by tragedy. First, as I noted recently on SacredCowChips, the supposed escalation in mass shootings at schools is a myth. 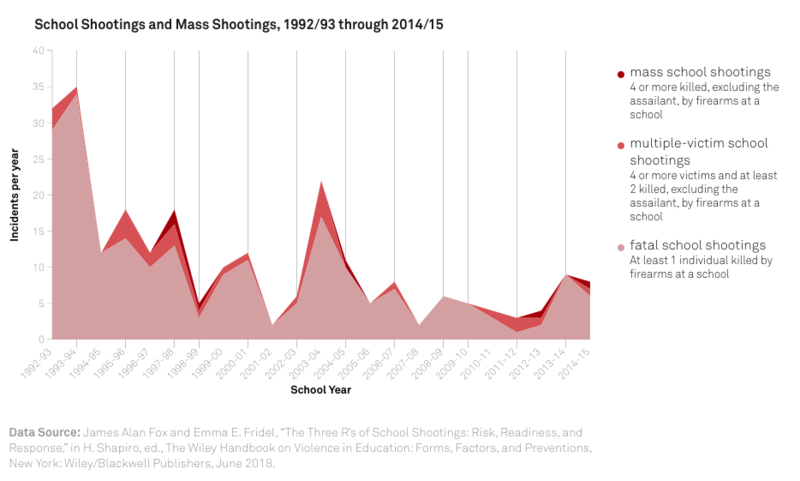 Northeastern University provides this summary of the research quoted in my post, including the chart on the long-term decline in school shootings shown above. In light of these statistics, the lead researcher, James Alan Fox, believes that most school security measures are counter-productive, including proposals to arm teachers. I do not fully agree, but be that as it may, it is astonishing that the media and large swaths of the public have accepted as fact the myth of a school shooting epidemic. The ignorance of would-be gun controllers about guns themselves is legendary. Few of them can actually define an “assault weapon” yet are convinced that they must be banned. The cosmetic addition of certain features to a standard semi-automatic rifle apparently makes these guns too “scary”. And there is little understanding that standard rifles sold today, which fire one shot at a time, are semi-automatic weapons! Rifles, by the way, are involved in only a small fraction of gun homicides, so the focus on “assault weapons” is misplaced. Given this level of ignorance, it’s all too easy to dismiss the gun control crowd as unworthy of a real debate over gun regulation. Of course, the crux of the debate revolves around constitutional rights. While many of those in favor of stricter gun regulation disavow any desire to repeal the Second Amendment or to actually confiscate guns, there is a significant contingent among them harboring that as an end-goal. Their ideal is politically laughable because it would never get a two-thirds vote of each house of Congress, let alone ratification by 3/4 of the states. The Second Amendment is described by its foes as outdated and dangerous. I submit, however, that the right to defend oneself against predators, human or otherwise, is a natural right and not subject to obsolescence. The Second Amendment was also intended as protection against tyranny by government, and it serves as protection against a tyranny of any majority or rogue minority. Gun-rights critics argue that the founders of our country did not anticipate the powerful weapons available today, and that they would never have intended citizens to be armed with them. The claim is dubious because the founders certainly would have believed that citizens should have the freedom to arm themselves at least in proportion to the arms used by potential predators (please forgive the use of the term “assault weapons” at the link). Frankly, I do not expect government tanks to roll down my street on a mission to confiscate guns. Instead, the first step would be a strongly-suggested voluntary sacrifice of weapons. Later, perhaps actual confiscations would be attempted via small detachments of authorities or perhaps by marauding, black-shirted proxies. But confiscations won’t happen as long as a serious threat of reprisal exists, with reasonably powerful weapons, and that is a credit to the Second Amendment. There are serious misconceptions (not to mention plentiful media propaganda) about the likelihood that stricter gun laws can reduce gun homicides, or that they could have prevented the mass shooting tragedies that have occurred. Some of those shootings are better viewed as failures of law enforcement — examples are the lack of official follow-up on prior tips about the shooter in Parkland, FL, the failure of the school’s resource officer to engage the shooter, the failure of the FBI to detain a shooter prior to an attack at the Pulse nightclub in Orlando, and in still other cases, the failure of background checks to identify individuals as ineligible to purchase guns. There is little doubt that proper enforcement of existing law and protocol would have prevented a number of mass shootings. The focus should be on improving the existing system before expecting responsible citizens to happily consent to further erosion of their natural and constitutional rights. Strict gun regulation would certainly infringe on liberty, leaving private citizens defenseless in exchange for tenuous assertions of social benefits. Defensive gun uses (DGUs) are thought to far outstrip gun homicides (seven posts touching on that subject are at this link). If guns could be effectively outlawed in the U.S., other instruments of homicide would replace guns because so much killing is driven by the drug war, gang activity, and other social dysfunctions. The same is true of suicides. If you recognize the futility of the war on drugs, you shouldn’t expect much success from a war on guns. Criminals will acquire guns whether they are illegal or not, so the ability to defend oneself with equal force is critical. There is a lively debate over the empirical research on the efficacy of stricter gun laws, but it’s always good to be skeptical when it comes to government prohibitions. Control advocates often cite Australia as an example of successful firearms control, but the country’s gun ban and buy-back program was ineffective in reducing gun homicides (also see here). Finally, it’s appalling to see the depths to which certain radical enemies of gun ownership will sink in attempting to cast blame on their opponents for mass shootings. In fact, they have blamed not just the NRA, but all gun owners for the Parkland shooting and gun homicides generally. But the NRA represents responsible, law-abiding gun owners and promotes safe and responsible gun use. Roughly 47% of adults in the U.S. have guns in their homes, and they own guns for self-defense or sporting purposes. Attempts to shame them into supporting curtailments on their liberties is obnoxious and rather foolish because it is so unlikely to be fruitful approach. Successful codification always hinges on consensus, which just doesn’t exist with respect to gun law in the U.S. The media have fawned over the students who have participated in the March For Our Lives campaign. The childrens’ ignorance of constitutional principles, and guns of course, is noteworthy, but their exploitation by powerful political and economic forces is pathetic. The significance of their numbers has been exaggerated as well: reports show the crowd size at the march in Washington, DC was about a quarter of what the organizers claimed. And the anti-gun students have failed to convince many of their peers, according to a poll conducted by USA Today/Ipsos. Perhaps as the spotlight fades, more of these student protestors will have occasion to study the U.S. Constitution and the natural rights it protects against government overreach. No matter how the kids feel now, I’m certain that many of them will be responsible gun owners someday. Gun-rights deniers often assert that access to guns increases the suicide rate, a question recently addressed by Ryan McMaken on the Mises Wire blog. He shows conclusively that suicide rates across countries are not related to gun laws. While gun ownership in the U.S. is extensive, and most gun deaths in the U.S. are suicides, the U.S. suicide rate is in the middle of the pack for OECD countries. Most of those countries have more restrictive gun laws. In fact, the U.S. suicide rate is lower than in Austria, Finland, France, Belgium, and Japan. Gun ownership rates are extremely low in Austria, France, and Japan. Therefore, suicide rates appear to be unrelated to legal gun ownership and the restrictiveness of gun laws. These facts, and simple logic, suggest that an individual in a state of extreme desperation has alternative means of taking their own life. The most nuanced argument that guns encourage suicides is based on a dichotomy of premeditated suicides versus suicides of impulsivity or passion. Most impulsive suicides, according to this view, are carried out with faster, less painful and more reliable methods, which would include the use of guns. That’s based in part on interviews with suicide survivors and the mental health records of non-survivors. However, it would not be surprising to learn that survivors actually had less intent to begin with; a comparison is impossible because we can’t ask the non-survivors. And whether a mental health record, or the absence of one, is always a reliable guide to the degree of impulsivity is open to question. So while there are differences in the mental health records of firearm suicide victims versus those who have used less reliable methods, the conclusions seem to rest on fairly unreliable measures of impulsivity or on survivor-only samples. Researchers don’t have much choice in the matter, but drawing conclusions based only on survivors is prone to severe bias. McMaken shows that guns account for most suicides only among those of age 55 and above, a group that is likely to be the least impulsive. Teenagers might be expected to be the most impulsive, but they tend to have lowest rates of suicide by firearms. However, a teen might not have ready access to a gun even if one is in the home. The teenage suicide rate is even less related to gun ownership across countries. New Zealand, Ireland, Finland and Canada come in much higher than the U.S. on this sad measure, and Australia, Japan, Switzerland, Belgium and Sweden are above the U.S.
At the previous link, the “British coal-gas story” is told to argue that cutting off a common means of suicide will lead to a permanent reduction in suicides. In this case, a changeover from coal gas for heating and cooking to natural gas is alleged to have led to a permanent decrease in total suicides in Great Britain in the 1960s, as death by “sticking your head in the oven” was no longer very reliable. However, other research has found compensatory increases in other forms of suicide, so the coal-gas lesson is suspect. Suicide is a manifestation of despair so deep that the victim simply cannot get on with life. Guns have nothing to do with that anguish. It may be true that failed attempts often lead to a renewal of spirit, but survivors still have a high rate of suicidal recidivism. Moreover, the question of the depth of the original intent for survivors is open to question. Those choosing guns for suicide might think it’s the best alternative, but clearly other alternatives will be chosen when guns are unavailable. The claim that access to guns makes people more vulnerable to taking their own lives is not supported by the data. In case there’s any misunderstanding, I include that quote NOT to denigrate gays, Muslims, or Democrats, but to emphasize the absurdity of blaming Christians for the Orlando shootings. To get a sense of the infectious silliness going around in leftist circles over the slaughter, read this account of a vigil for the Pulse victims held in Columbia, MO by several student organizations near the main campus of the University of Missouri, at which Latino activists scolded the gay activist crowd for being “too white” and for paying insufficient attention to racial issues. Of course, it’s true that many of the Orlando victims were Latino, but after all, the vigil was for them, too, not just the white victims. The left despises private gun ownership, or perhaps private anything except for their own privileges. Gun-blame feels so compassionate to them, and in this case, it conveniently avoids any mention of the killer’s ethnicity and radical ideology. Agitators say that “assault weapons” must be banned, but they are generally unable to articulate a precise definition. More thorough background checks are another favorite “solution”, but that’s based on an article of faith that such checks would be effective. Without proof that background checks actually work, and there is none, it still seems like a good idea to the “do something” crowd. Then, there are those whose real agenda is to ban guns outright, despite the fact that gun bans are counterproductive and infringe on the rights of law-abiding citizens. Another contention made by ill-informed opponents of gun rights is that mass shootings are never stopped by citizens with guns. That is simply not true, but it is good propaganda because foiled shooting attempts tend to receive much less notice than actual mass shootings. This article by Eugene Volokh provides a list of confirmed incidents in which a mass shooting was averted by a citizen carrying a gun. This situation has its counterpart in the left’s denial that defensive gun uses (DGUs) occur more frequently than gun crimes. DGUs are difficult to count because they often go unreported and may not even require the firing of a shot. Another mistake is the continued advocacy for “gun-free zones” (such as the Pulse nightclub) within which even guards are not allowed to carry firearms. Andrew Napolitano rightly labels these “killing zones”. Advocates of assault weapon bans and wider background checks are inclined to characterize gun rights supporters as paranoid. As Volokh explained last year, however, there is strong reason to believe that the pro-gun lobby has correctly assessed the motives among the opposition as more extreme. Volokh notes that an ineffectual ban, like the 1994-2004 assault weapon ban and many other gun bans internationally, cannot outweigh the interests of society in protecting a basic liberty. And as to basic liberties, Rolling Stone offers a wonderful illustration of the left’s disregard for individual rights and constitutional protections in an angry missive to gun rights supporters: “4 Pro-Gun Arguments We’re Sick of Hearing“. The author not only holds the Second Amendment in distain: vogue left-think has it that the entire Constitution is tainted because the framers were unable to agree on abolition 230 years ago (at a time when slave ownership was commonplace among the aristocracy). The fact that many of the founders were sympathetic to abolition makes little difference to these critics. They say the Constitution is not a legitimate framework for governance, despite its extremely liberal point of view on issues of individual rights. Apparently, Rolling Stone would be just fine with abrogating the free speech rights of gun advocates. Over the past 20 years or so, case law has increasingly viewed the Second Amendment as “ordinary constitutional law“, meaning that it protects individuals’ right to bear arms. The “well-regulated militia” limitation written into the Second Amendment is no longer accepted by the courts and most legal scholars as a limitation on individual rights. The militias it references were state militias raised from the civilian population, and the armaments they used were generally owned by the same civilians. In any case, there is no time limitation imposed on gun ownership by the Second via that clause. An earlier discussion of these issues was provided by Eugene Volokh in “The Commonplace Second Amendment“. In other words, we do not derive our rights from government or the majoritarian passions of the moment. Finally, the debate in Congress this week has centered on whether individuals on the FBI’s Terrorist Watch List should be denied the right to purchase a gun. That might seem like a no-brainier, but it raises legitimate concerns about civil liberties. There are about 700,000 people on that list (some reports put the number much higher), many of them U.S. citizens; some of them are there by mistake. Individuals on the list have not been convicted of a crime and are therefore entitled to due process under the Fifth and Fourteenth Amendments. Watch Rep. Trey Gowdy’s passionate defense of due process to a DHS official this past week. When the ACLU and congressional republicans agree on the tyrannical nature of a restriction like this, you just can’t dismiss it out-of-hand. Such a change in the law cannot be justified without a fast and effective process giving citizens on the list a right of challenge. The left is bereft of competence on the matter of guns, gun rights and the Constitution generally. They consistently demonstrate a dismissive view of individual liberties, whether that involves guns, religion, property, speech or due process. The tragedy in Orlando deserves more than ill-informed, knee-jerk conclusions. The most productive approach to terror risks involves individuals able to protect themselves and help watch out for others. That’s consistent with the position of the gay gun-rights group Pink Pistols. More power to them! Campaign finance is an area of internal conflict for some libertarians. On one hand, they do not believe in restrictions of any kind on freedom of expression. That implies no limits on what an individual can spend in support of a political cause, by themselves or in association with others, and whether it merely promotes a point of view or supports a political candidate. At the same time, libertarians are strongly opposed to rent-seeking activity, or efforts to use government power to promote private interests. Political spending is seen by many as an avenue for rent seeking, which suggests to them a need for limits on campaign contributions. In fact, full-throated support of free speech and opposition to campaign limits do not stand in conflict. The reasons are: 1) such limits are an assault on free speech; 2) campaign contributions represent “small change” in the larger scheme of rent-seeking pursuits; 3) contributions seldom represent direct efforts to influence policy; and 4) imposed limits have a detrimental effect on the ability of elected officials to do their jobs. Free speech, long interpreted by the courts more broadly as free expression, is protected by the First Amendment to the U.S. Constitution. This includes political expression, but traditionally it included campaign contributions as well, the latter being an obvious mechanism by which one can express views. However, the Supreme Court has upheld statutory limits on individual contributions to specific campaigns, as well as disclosure rules, on the grounds that they prevent corruption (Buckley v. Valeo and more recently McCutcheon v. Federal Election Commission(FEC)). I view the contribution limits as a contravention of the First Amendment, denying an enumerated right on the grounds that it “might” lead to corruption. If preventing corruption is the sole rationale for these limits, then government itself should be sharply limited, as it most certainly leads to graft and corruption at the expense of relatively powerless taxpayers. A well-known Supreme Court case decided in 2010 involved independent political speech, as opposed to expression of political preference revealed by campaign spending. This was Citizens United v FEC, in which the Court ruled that political speech cannot be restricted on any basis other than corruption. As described by Ilya Shapiro, the case is widely misunderstood. One point of interest here is that the case related to speech by an organization rather than an individual. The Court ruled that a corporation (a nonprofit in the case) could not be prevented from airing a film critical of Hillary Clinton, striking down provisions of the Bipartisan Campaign Reform Act of 1990 (McCain-Feingold) under the First Amendment. The Citizens United decision was NOT about campaign contributions. As an interesting aside, in a search of cartoons related to campaign finance, a great many imply that the Supreme Court abolished such limits in Citizens United. It did not. Even given some level of disaffection, it is hard to account for the near-complete lack of understanding about the case. More informed critics of the decision bemoan that fact that it allows speech by corporations (and unions and other associations) to go unlimited, though they don’t seem to mind the absence of limits on political speech by media corporations. (See Eugene Volokh’s view in the Brown Daily Herald and Michael McConnell’s reinterpretation of Citizen’s United as a Press Clause case in the Yale Law Journal.) The critics also fail to recognize that corporations are associations of individuals, who are otherwise subject to no restrictions on independent speech or on what they can spend to speak independent of any political candidate (as established in Speechnow.org v. FEC in 2010). The technical treatment of a corporation as a “person”, which many find objectionable, is beside the point. Only by distorting the meaning of the First Amendment can any limitation be placed on the freedom of individuals to speak in association with others. Another point raised by Ilya Shapiro is that corporate spending growth has neither accelerated nor decelerated in the wake of Citizens United. Moreover, restrictions on direct campaign contributions are still in place. However, campaign contributions are a relatively small percentage of corporate “influence spending”, averaging roughly 10% of the total between 2007 and 2012 for 200 large “politically active” corporations. Thus, direct campaign contributions are unlikely to be the primary avenue for rent-seeking activity. They might help buy “access” to politicians, but they may not be especially effective in influencing policy. These points are supported by University of Missouri economist Jeffrey Milyo in “Politics Ain’t Broke, So Reforms Won’t Fix It“. Milyo marshals empirical evidence that should make us skeptical of campaign finance reform efforts. Jonathan Adler of Case Western emphasizes the legislative dysfunction created by campaign finance reforms. McCain-Feingold places limits on funds candidates can receive from their political parties and other sources, forcing them to spend a large proportion of their time on fundraising (and placing incumbents at a distinct advantage). If there is a shred of sincerity in the populist insistence that members of Congress be subject to tighter term limits, or that Congress is woefully unproductive, then full repeal of these limitations should be a priority. The chief advantage of combatting corruption through regulating campaign finance is that it is a visible target. However, it is a target too rich with free speech implications. Disclosure requirements are one thing (through arguments can be made against infringements on the privacy of contributors as well). Limiting forms of expression outright is draconian, and reformers are unlikely to be satisfied until campaigns are funded entirely by taxpayers. Attacking “corruption” via limits on campaign contributions presumes a need to protect both contributor and recipient from their own guilt. Even if contributions help gain better access to an elected representative, it does not imply that the representative will act on motives counter to the perceived public merits of an issue. Moreover, the argument that limits on direct contributions to candidates “keep money out of politics” is flawed. Limits simply change the distribution of political spending, increasing the reliance on bundlers and organizations like Super PACs, and shifting the tables in favor of incumbents. There are far better ways to combat corruption among legislators and others in government, some with more severe drawbacks than others. Term limits are one possibility, but would deny voters of legitimate choices. Another option is to allow candidates to have unrestricted access to campaign funds through central organizations, rather than forcing them to rely on independent Super PACs, which cannot always be relied upon to craft a candidate’s preferred messages. Immediate disclosure of contributors and amounts would help to bring more transparency to the campaign finance process. Stiffer disclosure requirements for “bundlers” would also help. Perhaps elected executives could be prohibited from appointing bundlers to positions of authority, though a precise definition of “bundler” might become contentious. There are other reform possibilities related to limiting permissible lobbying activity. The libertarian’s dilemma with respect to campaign finance is easily resolved once the focus is placed squarely on protecting individual rights. In the end, the best defense of individual rights and against corruption in government is to limit government. It’s wise to place strong reigns on an institution that operates by virtue of coercive authority. The danger was well-acknowledged by the limits on government power enshrined in the Constitution.